Not to be confused with KTVT, a CBS-owned station in Fort Worth, Texas. KTTV, channel 11, is an owned-and-operated television station of the Fox Broadcasting Company, located in Los Angeles, California, United States. KTTV is owned by the Fox Television Stations division of 21st Century Fox, and operates as part of a television duopoly with KCOP (channel 13), Los Angeles's MyNetworkTV station. The two stations share studio facilities within the Fox Television Center in West Los Angeles, and KTTV's transmitter is located on Mount Wilson. KTTV's origins can be traced to December 1946, when the station's license and construction permit was secured by the Times-Mirror Company, publishers of the Los Angeles Times. It was one of five licenses that were granted simultaneously by the Federal Communications Commission (FCC) to parties interested in launching commercial television stations in Los Angeles. In 1948, CBS, which owned KNX radio, purchased a 49% interest in the station and assisted in completing its construction in exchange for making channel 11 the network's Los Angeles television outlet. KTTV began operations on January 1, 1949 and was operated initially by KTTV, Incorporated, the Times/CBS-owned holding company. The station's first telecast was the Tournament of Roses Parade, which channel 11 would air every New Year's Day until 1995. Later in 1950, CBS chose to acquire its own station in Los Angeles – KTSL (channel 2, later KNXT and now KCBS-TV) – which was being spun off by the Don Lee Broadcasting System as a result of its sale to General Tire and Rubber. The KTSL purchase forced CBS to divest its interest in KTTV due to FCC rules in effect at the time that barred the common ownership of two television stations in the same media market; the Los Angeles Times would regain full ownership of channel 11 when the sales were finalized on January 1, 1951. KTTV's relationship with CBS ended after exactly two years as the network moved its programming to KTSL. A few months later, channel 11 agreed to become the new Los Angeles outlet of the DuMont Television Network, which had been affiliated with KTSL and, before that, KTLA (channel 5). By the 1970s, KTTV offered a traditional general entertainment schedule common among independent stations at the time, consisting of children's programs, off-network reruns, sports programming and movies, along with a 10:00 p.m. newscast. The station, along with KTLA, KCOP and KHJ-TV, became a regional superstation that was seen on various cable television providers across the southwestern United States during the 1970s and into the 1980s, as far east as El Paso, Texas. In 1986, Australian newspaper publisher Rupert Murdoch and his company, the News Corporation (which had acquired a controlling ownership interest in the 20th Century Fox film studio the year before), purchased KTTV and the other Metromedia television stations. The Metromedia stations ended up becoming part of a new holding company formed by News Corporation called Fox Television Stations; those stations formed the basis for the new Fox Broadcasting Company television network, which made its debut on October 9, 1986. Following the News Corporation purchase, KTTV added more first-run syndicated talk, court and reality shows. By the early 1990s, it began to run afternoon cartoons from the network's Fox Kids block (which debuted in 1990), as well as top rated off-network sitcoms during the evening hours. KTTV removed cartoons on weekday mornings in June 1993, due to the launch of the morning newscast Good Day L.A.
KTTV also airs reruns of I Love Lucy, which had premiered in 1951, months after the station lost its CBS affiliation. Reruns of the sitcom are still popular among Southern California viewers and have continued to air in the Los Angeles market perpetually since the series ended its run in 1957, thus making KTTV only the second station in the market (the other being KCBS-TV) to continue airing the sitcom since it ended. Weekday airings of I Love Lucy have since moved to KCOP (which airs the program in a two-hour block), but KTTV continues to air the landmark sitcom on weekends during the late afternoon hours. In 1996, KTTV relocated its longtime studios on Sunset Boulevard in Hollywood, known as "Metromedia Square" (and later renamed the "Fox Television Center") to a new studio facility a few miles away on South Bundy Drive in West Los Angeles, near the Fox network headquarters (the network's headquarters are located on the 20th Century Fox studio lot). Several television series were filmed at the historic Metromedia Square television studio (which was once home to Norman Lear's Tandem Productions and TAT Communications Company) such as The Jeffersons, Mama's Family, Diff'rent Strokes, One Day at a Time, Soul Train, Mary Hartman, Mary Hartman, and the groundbreaking sketch comedy In Living Color. Many of those programs, either in first-run or off-network syndication, aired on KTTV. The complex was demolished in 2003 to make way for the construction of Helen Bernstein High School (which is part of the Los Angeles Unified School District). With the return of the Rams NFL franchise to Los Angeles in the 2016 NFL season, via Fox's contract with the NFL, KTTV became the unofficial "home" station of the Rams, as Fox owns Sunday afternoon coverage of most games in which an NFC team is the visitor; the Rams are part of the NFC West. It had held this role for one season in 1994 prior to their move to St. Louis. In addition to carrying the entire Fox network programming lineup, KTTV serves as a flagship station for TMZ on TV and Dish Nation. Other syndicated programming broadcast on KTTV including The Dr. Oz Show, Harry, and The Wendy Williams Show, among others. From the team's move to Los Angeles in 1958, KTTV carries the Los Angeles Dodgers baseball games, the station airs the road games beginning in the late 1970s with the home games on the subscription/pay-per-view service Dodgervision, these road games aired on the station was last until 1992, when KTLA began airing the road games beginning with the 1993 season. Currently, Dodgers games was broadcast nationally through the network's sports division via its MLB package since 1996, the Dodgers games was currently broadcast locally through SportsNet LA. With the return the Rams NFL franchise to Los Angeles, since 2016, KTTV became the 'unofficial home' for the Los Angeles Rams through the network's primary rights of the National Football Conference; during the regular season, Rams games are rotated with KNBC (through NBC Sunday Night Football and Thursday Night Football), KABC-TV (through Monday Night Football) and most especially KCBS-TV (through the NFL on CBS and TNF). KTTV presently broadcasts 45½ hours of local newscasts each week (with 8½ hours on weekdays and 1½ hours on weekends); this gives KTTV the second-largest local news output of any television station in the Los Angeles market, behind CW affiliate KTLA's 65½ hours of weekly newscasts. As is standard with Fox stations that carry early evening weekend newscasts, KTTV's Saturday and Sunday 5 p.m. newscasts are subject to delay or preemption due to network sports coverage. KTTV operates a Eurocopter A-Star 350 B-1, branded on-air as "SkyFox HD" (pictured right), to provide aerial coverage of breaking news stories. 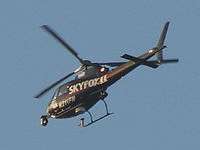 KTTV previously operated two helicopters; one of them (known as "Sky Fox 2") was destroyed after it crashed at Van Nuys Airport in 2000. In June 1993, the station launched a new morning news program called Good Day L.A., a program that was inspired by sister station WNYW's Good Day New York, which debuted in 1988. On July 14, 2008, KTTV launched a half-hour 10 a.m. newscast, following Good Day L.A., as the station's first midday newscast since the mid-1980s; KTTV is currently the only station in Los Angeles to have a local newscast in that timeslot. KTTV and KCOP began producing its local newscasts in high definition on October 15, 2008. On December 1, 2008, KTTV fully took over production of KCOP's 11 p.m. newscast, which was reduced from an hour to 30 minutes and retitled Fox News at 11, marking the end of a KCOP-produced and branded newscast. The newscast on channel 13 then became anchored by KTTV's 10 p.m. anchors Carlos Amezcua and Christine Devine, as it was considered an extension of the earlier newscast. On April 28, 2016, KTTV changed the name of its 5 p.m. newscast to Fox 11 5:00 News using the same anchors from Studio 11 L.A. Weekend early evening newscasts will now be called Fox 11 Weekend News. ↑ "Six Los Angeles video grants; Don Lee delayed." Broadcasting - Telecasting, December 23, 1946, pg. 90. ↑ "CBS, 'L. A. Times' to operate KTTV." Broadcasting - Telecasting, May 3, 1948, pg. 27. ↑ "KTTV opens; Rose Bowl events mark debut." Broadcasting - Telecasting, January 3, 1949, pg. 31. ↑ "KTTV (TV) moves; sets Nassour Studios for film making." Broadcasting - Telecasting, March 13, 1950, pg. 53. ↑ "KTTV buys Nassour Studios; sale price $2 million." Broadcasting - Telecasting, May 22, 1950, pg. 45. ↑ "KTTV leases studios." Broadcasting - Telecasting, July 11, 1949, pg. 57. ↑ "Don Lee sale; General Tire bid sets record."] Broadcasting - Telecasting, October 30, 1950, pp. 21, 30. ↑ "Don Lee sale; General Tire purchase approved." Broadcasting - Telecasting, January 1, 1951, pp. 19, 68. ↑ "KTTV-DuMont; affiliation planned April 11." Broadcasting - Telecasting, March 19, 1951, pg. 61. ↑ "KTTV to Metromedia for $10 million plus." Broadcasting, January 14, 1963, pg. 9. ↑ "FCC okays sale of KTTV(TV) Los Angeles." Broadcasting, June 3, 1963, pg. 75. ↑ "Metromedia assumes KTTV(TV) operation." Broadcasting, July 8, 1963, pg. 72. ↑ "Metromedia adds KLAC in $4.5 million deal." Broadcasting, March 18, 1963, pp. 9-10. ↑ "Changing hands." Broadcasting, March 22, 1965, pp. 110-111: Metromedia acquires KRHM (94.7 FM) and sells KLAC-FM (102.7 FM); the FCC allows both facilities to exchange call letters. ↑ Fox Stations Moving To WorldNow Platforms, TVNewsCheck, April 16, 2012. ↑ "RabbitEars.Info". RabbitEars.Info. Retrieved 2011-11-09. ↑ "Mobile DTV Station Guide | www.omvcsignalmap.com". Mdtvsignalmap.com. Retrieved 2011-11-09. ↑ "YouTube video of analog TV shutoffs in Los Angeles". Youtube.com. Retrieved 2011-11-09. ↑ "FCC DTV status report for KTTV". Fjallfoss.fcc.gov. Retrieved 2011-11-09. ↑ "KTTV Launches 12:30 p.m. Show – 2009-04-23 18:34:50 | Broadcasting & Cable". Broadcastingcable.com. Retrieved 2011-11-09. ↑ KTTV Launching 5 PM News, Broadcasting & Cable, June 20, 2011. ↑ "Studio 11 LA". Myfoxla.com. Archived from the original on November 15, 2011. Retrieved 2011-11-09. ↑ Phil Shuman (investigative reporter) (2007-07-26). "Fox 11 Investigates: 'Anonymous'". KTTV (Fox). Archived from the original on May 22, 2008. Retrieved 2009-01-13.